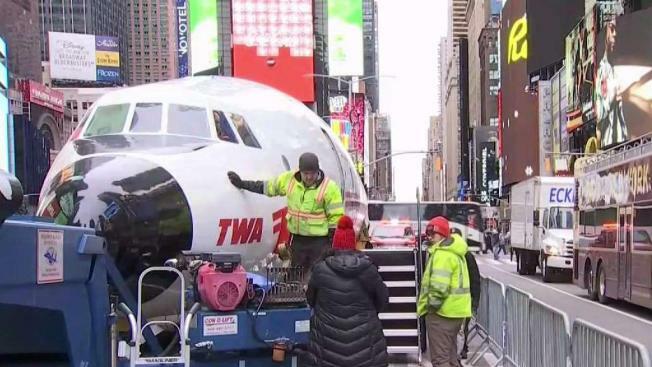 A vintage TWA plane makes a stop in Times Square before it becomes a cocktail lounge. A vintage plane that went from flying passengers in the 1950s to running drugs in the 1970s visited Times Square on Saturday before its next transformation into a cocktail lounge at the former TWA terminal at Kennedy Airport. The fuselage of the 1958 Lockheed Constellation is spending the weekend in Times Square as part of an upcoming documentary about the redevelopment of Eero Saarinen's landmark TWA Flight Center into a hotel. The plane arrived in New York in November from Maine, where it was being restored. It was trucked Friday night from Kennedy Airport to Times Square, where the same model plane was featured in an eight-story billboard in the late 1950s. Governor Cuomo and developers broke ground Thursday on what will be the first hotel on JFK Airport grounds. Andrew Siff Reports. The Constellation, known as Connie, flew for TWA for three years before it was forced into retirement by the Boeing 707. It was later used as an Alaskan bush plane and then was used as a marijuana dropper by South American drug traffickers. The plane was bought last year by MCR/MORSE Development, the developers of the soon-to-open TWA Hotel. MCR CEO Tyler Morse said the vintage plane will serve as a cocktail lounge at the hotel. "We're trying to recreate the theater of the hotel and make it a special experience," he said Saturday. The 512-room TWA Hotel is scheduled to open in May and will be the only hotel on the airport's grounds. It is intended as an homage to the era when Saarinen's gull-winged TWA Flight Center opened in 1962. The terminal closed in 2001 when TWA was acquired by American Airlines. Mayor Bill de Blasio, who joined Morse at an event to welcome the vintage plane to Times Square, said the landmark TWA terminal is "going to be a vibrant hotel and conference space, and part of our city again."